When you take a look around the Town of Unicoi, you will see the Buffalo all around. Maybe not live animals, but their picture, symbol, and name. There is even a buffalo head in our Tourist Information Center. He is placed over the fireplace so he can get a good view of those who stop in to visit and gaze at his beauty. The buffalo was an obvious choice for the Town of Unicoi since there is a long history with buffalo in this area. Buffalo Mountain, Buffalo Creek, Buffalo Valley, North Indian Creek and South Indian Creek continue to symbolize the history of the area and give tribute to the first inhabitants of the area, the buffalo and the Cherokee Indians. On October 21, 2013, the Board of Mayor and Alderman of the Town of Unicoi passed a resolution 2013-207 to establish a Town Brand because of the historical significance to the area. The American Buffalo were once native to the Town of Unicoi and the surrounding area. It is believed that there were up to 60 million buffalo after the arrival of the first Europeans. Two of the first Englishmen to see the Great Valley of East Tennessee were James Needham and Gabriel Arthur. The two were sent by Colonel Abraham Wood in 1673 from Fort Henry to explore the area west of the Southern Appalachians and to establish a trading path with the Cherokees. 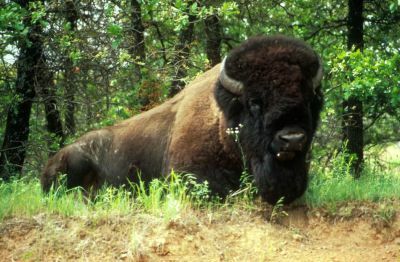 For centuries the buffalo had sustained the powerful Cherokee Indians and earlier native people who followed the traces. The route Needham and Arthur traveled followed buffalo and Indian trails leading along the Occanoechi path. A portion of the trail used by Needham and Arthur was the Great Buffalo Trail which follows Buffalo Creek and goes around the end of Buffalo Mountain and past the present day Tipton-Haynes tract in Johnson City, Tennessee. The Great Buffalo Trace is believed to have been used by migrating buffalo herds that numbered as many as 8,000 buffalo. So what is a buffalo trace? Over time, buffalo cut a narrow path in the woods as they walked with their herd nose to tail in one long line. Their size and sharp hooves pounded down tails in open land, chipping out land and rock until the path lay 3-4 feet below ground level. Banks along the sides of some trails have raised as high as 6 feet. In 1789, John Sevier (frontier leader and later Tennessee's first governor) defeated a large band of Cherokee and Creek warriors at Rocky Fork in what is now southern Unicoi County. In his own words, Sevier stated "It was the bloodiest fight in all the Cherokee Wars". Soon after this historic battle, both the buffalo and the Indians began to disappear from the land, eventually leaving behind only the places for which they were prominently known.